ArcGIS Online helped the Armed Forces of the Philippines (AFP) keep track of the many leaders that were in the country for the Asia-Pacific Economic Cooperation (APEC) meeting. The Armed Forces of the Philippines (AFP) works with the Philippine National Police and other agencies on national security initiatives, disaster relief, and recovery operations. Coordinating these efforts used to be difficult. The Philippines comprise more than 7,000 islands, and the capital of Manila is one of the busiest port complexes in the world, given that more than half of commercial shipping navigates the South China Sea. Several years ago, the AFP implemented an enterprise-wide ArcGIS platform to make it easier to analyze information and share geospatial data both within its department and with other agencies as needed. Not only does this make it easier for the AFP to manage Manila’s dynamic port, but it also helps the agency keep the booming capital and the rest of the country safe and secure—especially during the regular staging of political, cultural, and religious events, which swell the local population significantly. The AFP uses ArcGIS for mission planning and situational awareness during operations. To give planners and commanders easy access to its operations geodatabase, the agency developed a portal that is supported by ArcGIS for Server. Additionally, the AFP began testing the use of ArcGIS Online in its operations shortly after the software was released in 2006. 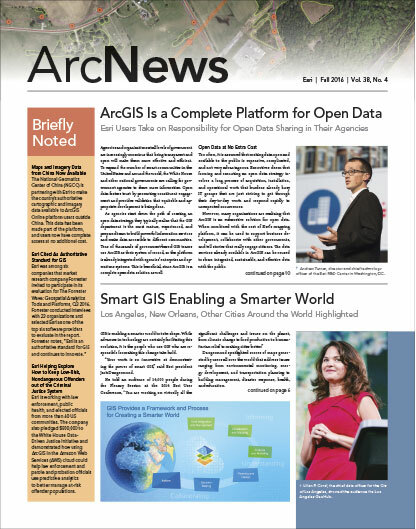 With assistance from Geodata Systems Technology, Inc. (Esri’s distributor in the Philippines), the AFP also implemented Operations Dashboard for ArcGIS in 2012. That same year, the AFP put its robust ArcGIS implementation to the test when it was used to coordinate security operations for Manila’s Feast of the Black Nazarene, celebrated each January 9. This festival, wherein a life-size statue of Jesus is carried along a jam-packed 4.5-mile route over a period of about 20 hours, attracts millions of Catholic pilgrims to Manila’s Quiapo district so they can have a chance at touching the statue, which some believe has healing powers. 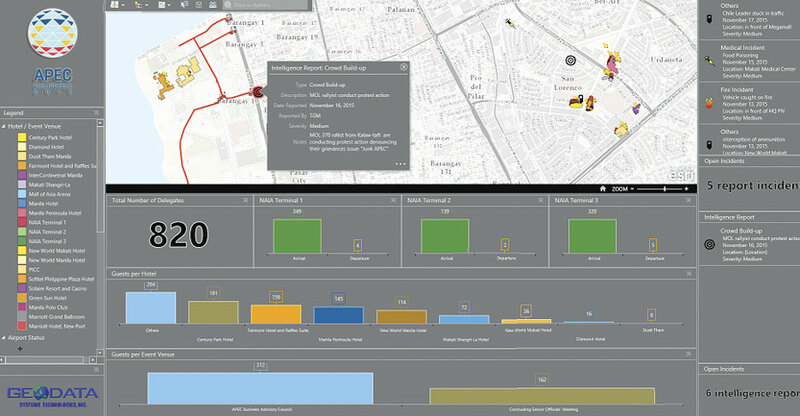 A multiagency coordination center used Operations Dashboard for ArcGIS to monitor criminal incidents, traffic conditions, and protests in and around the areas where APEC delegates were meeting. Using ArcGIS Online, the AFP pulled in existing data for the procession area and added a temporary street closure layer to get a better understanding of the flow of foot traffic and how it might affect vehicular traffic, which is typically congested throughout metropolitan Manila. When incidents such as crowd surges or car accidents occurred, field officers reported them and they were immediately added to the AFP’s dashboard. “This allowed us to establish live feeds of authoritative incident data that we could share with our staff and other agencies involved in the security operations so that we could quickly dispatch police officers or emergency services when necessary,” said Espina. Since GIS worked so well during that religious gathering, the AFP used ArcGIS Online again for planning and security operations when Pope Francis visited the Philippines in January 2015. This was the largest papal event on record, with a reported 6 million worshipers attending the Pope’s final Mass at Manila’s Luneta National Park. 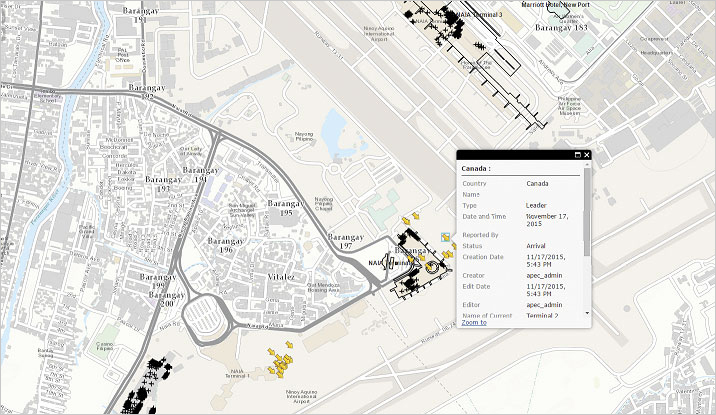 The agency used ArcGIS Online to monitor and update the Pope’s location and keep track of where security forces were deployed. In 2015, the Philippines also hosted a series of meetings for the Asia-Pacific Economic Cooperation (APEC). The organization, which provides a forum for 21 Pacific Rim countries and select invitees to discuss common financial concerns and ways to establish new markets or expand existing ones, rotates its annual meetings among members. For the Philippines assembly, a series of high-level meetings was staged throughout the country, beginning in the last quarter of 2014 and culminating at the APEC Economic Leaders’ Meeting (AELM) in Manila in November 2015. This last meeting was attended by business leaders, as well as some heads of state from APEC member nations, including US president Barack Obama, Chinese president Xi Jinping, and Japanese prime minister Shinzo Abe. 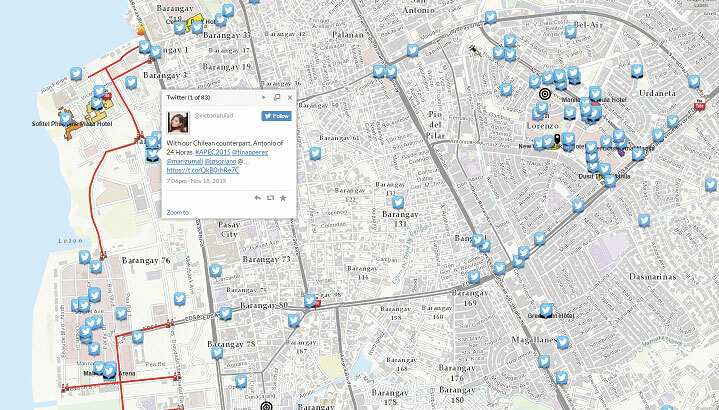 The AFP used Twitter feeds as one of its layers to monitor what people were saying about APEC. Security preparations for the meeting were extensive. Because of its high-level nature, a multi-agency coordination center (MACC) was set up with 18 Philippine government agencies contributing data and managing the center’s operations. The AFP also used the dashboard to monitor criminal incidents, traffic conditions, and protests that happened both inside and outside the areas where delegates were meeting. This was critical because local residents had access to the areas near the summit locations. The AFP used Twitter feeds as one of its layers to help monitor what people were saying about APEC. This is particularly important for real-time, netizen-based situational awareness. Espina said that for nonprogrammers like himself, it is easy to design an app, give it some functionality, and publish it when there is an immediate requirement for situational awareness and monitoring. An immediate need like this arose when Typhoon Haiyan, known in the Philippines as Super Typhoon Yolanda, made landfall on November 8, 2013. The record-breaking storm produced winds estimated at 196 miles per hour (315 kilometers per hour), according to the Joint Typhoon Warning Center. It devastated areas of Southeast Asia, particularly in the Visayas, a group of islands in the central region of the Philippines. Around 6,300 people were reported dead with nearly 30,000 injured. Property damage estimates were between $6.5 and $14.5 billion, according to AIR Worldwide. After the storm hit, the AFP received immediate support from Esri’s Disaster Response Program (DRP), which is available around the clock to help with emergencies. Using ArcGIS Online, the AFP coordinated relief services and deployed troops to help maintain order. The agency also used GIS to determine the conditions of roadway infrastructure and plan alternative travel routes where necessary. In the aftermath of the typhoon, the AFP Command Center built an app that monitored the distribution of relief goods to make sure there were adequate supplies in affected areas.